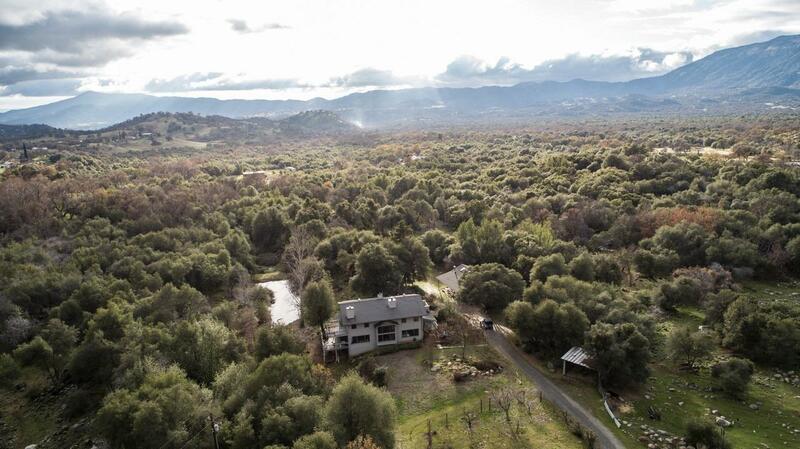 Beautiful, well maintained property above Springville. Ample room for animals or projects on over 34 acres of tranquility. This is a 2780 SQFT home with 3 bedroom/2 bathroom. Walk in to the main room that has vaulted ceilings, hardwood floors, and a beautiful rock fireplace. Indoor laundry/utility room and upstairs family/play room with a pool table. Stay in and enjoy the amazing views from floor to ceiling windows in the living/family room while you relax by the fireplace or enjoy the outdoors on either your deck overlooking the creek and pond or your spa looking at the mountains nearby. Once outside, enjoy time in your workshop, in the hay/livestock barn or play horseshoes in your outdoor play area. Workshop is over 1600 SQFT. There is a bunk house with its own rock fireplace for your guests. So many options you don't want to miss this one.